The School Council of Moss Park Infants were set on a mission to create an Outdoor Classroom for learning and play. The children shared ideas and decided that the new outdoor area needed to promote reading and writing, messy play and even give some of their PETS a home. Our founder Andy Snell, had the pleasure of working with Moss Park and their School Council to bring these great ideas to life. The space chosen to develop was an old outdoor courtyard area that was mainly concrete with planters and two small ponds. The space could facilitate some natural learning but lacked any exciting resources and learning activities that their children could self-select from especially in regards to imaginative and creative play. To create a more inviting and safer area for play, it was time to replace the concrete with our bright and natural looking Playturf. 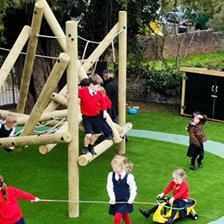 Our excellent artificial grass product brightens up the entire space and the fibres look and feel like the real thing. We ensured that one area was turfed with real grass as this would become the new home for the children’s pet guinea pigs. As the School Council wanted their new outdoor classroom to promote getting messy, we decided to add both our Mud Kitchen and Water Wall to create zones for water and mud play. The Mud Kitchen will promote collaborative play, as Moss Park’s young chefs work in teams to create their own special mud pies and cakes. With an integrated chalkboard on the serving side, children will be able to scribble on menus to advertise their scrumptious creations. The Water Wall will transform children into young scientists as they investigate topics such as the water cycle, gravity, source to mouth, kinetic energy and water recycling. The children of Moss Park can now enjoy working together to pump the water from the bottom reservoir to the top and watch with delight as it pours down via the water channels. We created an outdoor reading zone with our Story Telling Circle and a Chalkboard and Whiteboard either side of the Storytellers Chair. We created this calmer zone away from everything else to help children enjoy their reading experience without too many distractions and have a place for reflection and relaxation. During story time, children can take it in turns to sit in the chair and tell their favourite story to the rest of the class which will improve their self-confidence and spoken language. The mark making boards can be used for taking notes or drawing pictures to match the story they’re reading. To ensure the children still had opportunities for natural learning, planters are a prominent feature throughout their new playground area. As the sign says, happy planting children…. We attended the grand opening of Moss Park’s new outdoor learning environment and local MP, Kate Green did the honours of cutting the ribbon to officially open the area for use. It was a fantastic occasion and the children were full of excitement as they tested out their new playground equipment for the first time. Interestingly, the boys gravitated over to the Water Wall to begin pumping the water up to the top whilst the girls instantly went over to the Story Telling Area for some quiet reading. The guinea pigs were very popular amongst the children and we’re glad we managed to find a way to facilitate them into the area. The children then showed Kate Green and the rest of us around their new area and explained in detail how each piece of equipment worked. Before the development, what was your outdoor area lacking? Did you face many challenges? "When I joined Moss Park Infants as the new Head teacher in September, the courtyard space was very over grown with weeds, trees and shrubs. It was an unsafe space for children to use. It is my understanding that the school had previously tried to create a vegetable garden in an attempt to grow food. But this was not kept on top of and wasn't accessed by the children. The main challenge was funding the project to develop the space. This is when I began discussing with parents how we could go about fund raising. Parents said they would give their time to help prepare and strip back the over grown weeds and shrubs as well as fund raise towards the project. We were also lucky to obtain a successful lottery bid, which helped fund a large part of the development. The parents came together and prepared the space ready for the work to be carried out by Pentagon Play. They saved the school a lot of money. Parents have also organised a singathon day as well as a summer fair to help raise more funds." How was the old courtyard used by the children before the development? "The courtyard was not used by the children before the development as it was not a fun or safe space. The courtyard is such a big part of our school as it sits in the middle, surrounded by lovely large windows, so it is seen from all angles. It is also very easily accessed by both the year 1 and year2 classroom, so now our children can learn outdoors as part of their everyday learning." With the Outdoor Classroom now finished, what difference do you feel it will make to the children especially in regards to their learning and development? "A huge difference. We are an infant school and our children still need lots of opportunities to talk, explore, experiment, investigate, interact, problem solve. This is not always inclusive in a classroom environment as some children just need to be active and up on their feet. 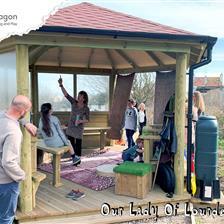 The space is well designed with a mud kitchen, reading area, water wall, grass and of course our school guinea pigs. This ensures all children are engaged in meaningful learning. It has meant that teaching can take place both in the classroom and outdoors which creates a culture for learning that hooks children in. I must mention the parents! The sense of pride that they have, having helped create this space for their children. They can see the lengths the school is going to, to make sure their children get the very best education. Parents have already signed up to leading gardening clubs with the children, so we can continue to grow fruit and vegetables, for our children to eat (and for the Guinea Pigs|)"
How did you find working with Pentagon Play? "Pentagon Play have been a friendly and efficient company to work with. I felt they listened to the ideas I had for the space and really used this when developing the area. They supported our open event and communication has been very good. We look forward to developing the nursery outdoor space with Pentagon Play in the near future as we have been very impressed with what they have done so far." If you're looking to extend your classroom to the outdoors and need a company you can trust and enjoy working with, simply Contact Us for a free consultation. 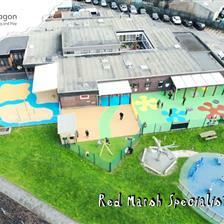 We're experts in creating inspiring outdoor learning environments for children from EYFS up until Key Stage 2.